Of these three games Tiddledy Winks is entirely devoid of generalship or mental skill. Pillow Dex has use for a certain degree of intelligence, while Ping-Pong, on the other hand, possesses larger opportunities for ability and strategy. The English people are very fond of games in which physical skill is employed. They are, in fact, also very fond of mental board games requiring strategy, although no good strategical board game has come out from England, while the United States has produced, in recent years, the great games of skill - Go Bang, Halma and Chivalry. Prior to Ping-Pong several inferior games of this kind were devised, more adapted, however, for the use of children than that of adults. One of these games was played with miniature strung rackets and a miniature net, and balls closely packed and covered with worsted netting. These balls had considerable "bounce" and the net was intended to be fastened between chairs. 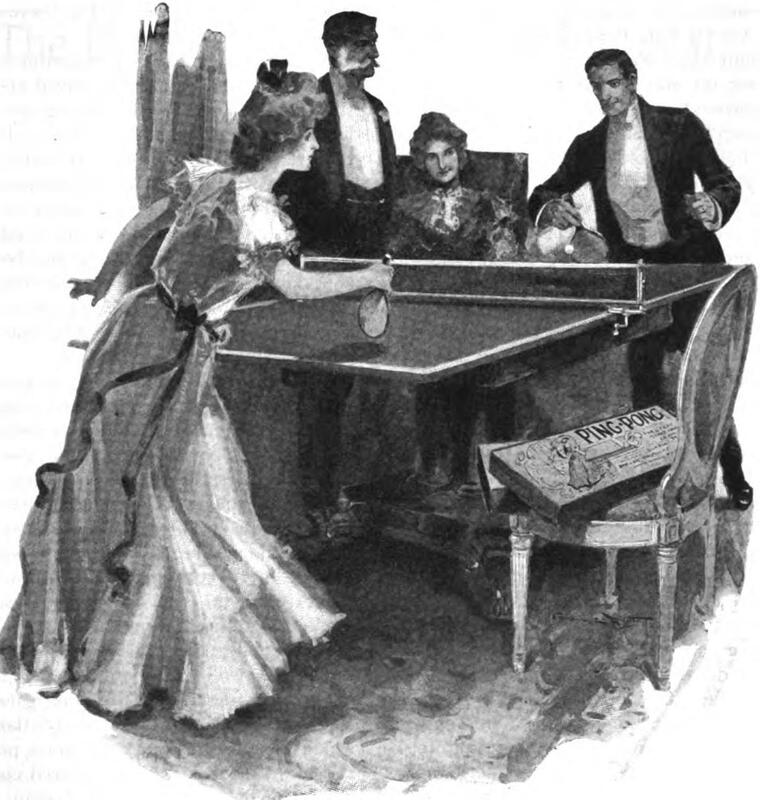 The game was sometimes used upon the floor and sometimes upon the dining room table. Even Pillow Dex balloons were used to make an indoor game of this class. To the adaptation of the celluloid ball with the old English battledore, used in battledore and shuttlecock, is due the invention of Ping-Pong, An English­man, a Mr. Gibb, first brought the game to the London house of Hawley Brothers, and in crude' form this little game was produced, with English battle­dores and Xylonite balls: The balls were roughly made and the game did not "go" very well; under the very unattractive name of Gossima it failed to attract much popular attention. The English firm, however, saw the possibilities of the game, and had some superior balls of celluloid made espe­cially for the purpose, of the same size and practically the same weight as those used today. The game in this improve form soon gained favor, and the Hamleys shrewdly devised and trademarked, both in Great Britain and in the United States, the now world famous name "Ping-Pong." The following winter, the game became a great success, and Messrs. Parker Brothers of Salem, Mass., the leading house of its kind on this side of the water, took charge of the introduction of the game into America, and became owners of the famous American trade mark and copyright. The enormous success of Ping-Pong increased and then quadrupled in both countries, and will, undoubtedly, this autumn and winter, reach the highest point of success a game has ever known. The immense success of Ping-Pong has induced the making of similar games, although differing and less popular in some very essential details. The most often seen of these imitations is "table tennis," which resembles, but is not the same as Ping-Pong, and is without the protected features of the world famous game. "The Laws of Ping-Pong," as the rules of the genuine game are called, have been prepared with great care by experts in the game, the most distinguished of whom is Mr. Arnold Parker, who won the amateur Ping-Pong championship in London and who has devoted much study and care to the game. There is neither space nor need, nor have I the right, as they are copyrighted, to give the "Laws of Ping-Pong" here, but it should be noted that they are quite dis­tinct from the miscellaneous rules which are made for imitative games. The racket is the most important of the implements used in Ping-Pong, although the quality, weight and sensi­tiveness of the ball is also a most impor­tant feature. Originally, the old English vellum battledore was used. 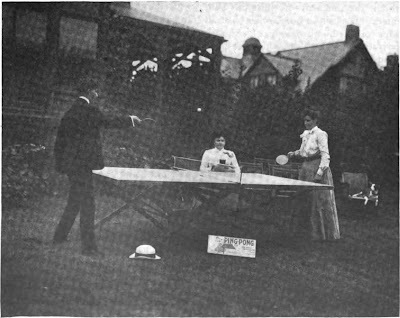 Arnold Parker himself won the great Queen's Hall Ping-Pong tournament in London with a vellum battledore. The solid racket, leather covered, is now the most popular with expert Ping-Pongists, though the Parkers have also made rackets in plain wood, corrugated wood, cork covered, rubber covered, emery covered, leather covered, and in fact of all kinds of material which the desires of the expert Ping-Pongist could demand. The object in making rackets of these different materials is to accomplish more readily the "spin" or "cut" of the ball, which is made to bound in various unex­pected directions after striking the sur­face of the table, caused by the draw of the racket across the surface of the ball in the stroke. In the last twelve months over twelve million balls have been made in America and England for Ping-Pong. The first placed was for only seven thousand balls, This shows the growth of the game. The perfect Ping-Pong ball should be both strong and light. The principal balls which are used are the "Match Ping Pong," adopted by the Ping Pong association and used in all leading American and English tournaments. Every "Match Ping Pong" ball is gauged as to size and weight; those under weight or of inaccurate size and shape being discarded. In addition there are several Xylonite and celluloid balls made, which are excellent. The Bisque ball, so called„ which is the ordinary ball, is, when perfectly made, desirable. The "halex ball" is a strongly made ball, but, in the opinion of most experts, too heavy and hard bounding to be adapted to fine play. For perfect play, a ball requires all of the following: strength, lightness and roundness, and should be what in baseball is termed a "dead" ball, that is, a ball which rises slowly, and which is sensitive to the cut, or, as the English call it, the "screw" imparted by the racket. As to tables, probably ninety-nine out of one hundred games are played upon that familiar article, the dining room table. For tournament, or perfect play, however, a table should be used which is not over two and one-half feet from the floor, and nine feet by five feet in size. The English champion prefers a table six by nine, but this has never been adopted. There are many excellent tables upon which a Ping-Pong set may be used. For home use eight by four is a good size. The net should be invariably of green material, bound all around with an edge of white, and should be, when extended, as nearly as possible, six and three-fourths inches above the table at its upper line, and should, for tournament purposes, be used only with extension posts, although the ordinary clamp posts are far more convenient for ordinary home use, as they are more easily applied to a dining room table. I have endeavored to give above a few essential facts. This is not the place for a technical description of the game. The foregoing facts are merely those which observations of a continuous play and test of "weapons" have proved con­vincing to the writer, and which seem to be in accordance with the leading authori­ties and players of Ping-Pong in America and England.